Simone L. just took over the leadership role in a mid-sized pharmaceutical contract manufacturing company. She had been with the organization for many years and was well-liked and respected by her peers. No one was surprised when she was chosen to succeed the retiring president. Simone felt she had the support of her co-workers. So she was unprepared when those relationships changed as she assumed the presidency. All of a sudden people were talking behind her back. She got push back on changes that she thought everyone had wanted for some time. There was buzz that one of her co-workers was resentful, and thought he should have been selected for the position. This isn’t unusual. Leadership both connects and separates you from those you lead. Change shifts the ground beneath your feet in relationships and increases uncertainty among those who used to be your peers. You may feel the same as ever, yet people see you as changed. Even as their respect may increase, so does the distance between you. So what’s a new leader to do? Build confidence by having a clear vision and voicing that direction consistently so people know where the organization is heading. Build trust by always doing what you say you’ll do. Build certainty through structure. Structure is calming and safe. Get used to being a little separated. Relationships will change. Expect it and stay calm and understanding. Above all, don’t take it personally. It goes with the territory. Inspired to Succeed: What business leaders can learn from a girl’s volleyball team. I’m writing this while watching the third match in my daughter’s Club Volleyball tournament. The team came out of the box slowly. It took them a little while to get communicating and start working as a team. They lost match 1 but it was close. In match 2 they found their focus. They killed and actually started to have some fun. But now in match 3, they’ve lost it again. They’re not talking to each other. They’re not working well together. They’re making mistakes. Blaming each other. And they’re certainly not having fun. This same thing happens to businesses trying to grow. They can fumble around trying to find their direction and ways to communicate an d best work together as a team. Then their efforts pay off and they experience some progress, some success. They get excited, start having fun. But often what they’ve created isn’t sustainable because they aren’t really paying attention to what’s working and what isn’t. They forget they’re in the middle of a process with no end. They stop communicating collaboratively. 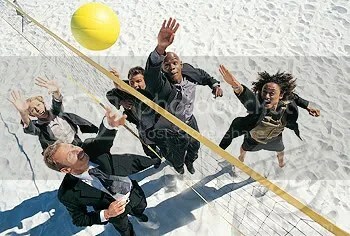 And they feel the same panicky, pressure that the volleyballers felt as they watched their success slipping away. 1. Realize that growth is a process. As you move from point A to point B, all kinds of things change and to be successful, you need to continue to adapt. Don’t get cocky with your first success and think you’re done with the work! 2. Analyze your progress. Look at what’s working and what isn’t. Look at what’s changed. Look at what is now possible that wasn’t before. Work smart. 3. Communicate. Blame only accelerates the loss. Start talking it up. Get team members input. Let them know what you’re doing and what you need from them. Keep everyone focused on getting to point B together. 4. Focus on the fundamentals. John Wooden (sorry for mixing sports metaphors) never had any team focus on winning. Instead he had them work and work on passing, shooting, driving down the lane. Do the same with whatever the fundamentals are in your business. Usually quality, customer service, and teamwork top the list. 5. Have fun. My daughter’s team started having fun when they started winning. What they didn’t realize is that you can accelerate your success by having fun first. Figure out how to make the process fun for everyone on your team and quality will improve, customer service will improve and the results will follow. Making it fun is one of the most powerful secrets to winning at business. Most companies don’t get this one right. 6. Celebrate. This is one thing the girl’s volleyball team has down. They celebrate after every play. When they ace the serve, it’s “Aaaahh, ace! Woop! Woop! “ On a good block, it’s “Access Denied!” And when they lose the point, they slap hands just as if they were congratulating each other. And in every way, they are moving forward, even when they lose the point. If they’re smart they’re learning from it. This week, one of my clients shared with me that a $300,000 lesson they were regretting a few years ago turned into something they are immensely grateful for today. That lesson more than paid for itself over time. I like the idea of celebrating this. In fact, I think I’ll start to celebrate all my progress, too. I invite you to join me.